By Dan Ambrose: WBC Diamond middleweight champion Sergio Martinez will have to wait a little while longer to get his shot against WBC middleweight champion Julio Cesar Chavez Jr. (44-0-1, 31 KO’s) because he’s not in the plans for Chavez’s promoter Bob Arum, who says he’ll likely match Chavez Jr. up with Miguel Cotto next if Chavez Jr. can get by challenger Marco Antonio Rubio (53-5-1, 46 KO’s) on Saturday night at the Alamodome in San Antonio, Texas. That’s a very confusing statement. That sounds like some kind of cryptic doubletalk from Arum. If Martinez isn’t that good, then why the comment about Arum not being in the business of seeing Chavez Jr. get beat? There wouldn’t be an issue about all this if the WBC hadn’t mandated that Chavez Jr. fight Martinez next. They were supposed to be fighting Martinez this Saturday but Chavez Jr. got special permission from the WBC to blow off the Martinez fight and take on Rubio instead. The WBC is saying that the right thing for Chavez Jr. to do would be to face Martinez after the Rubio fight, but they’re no longer ordering the fight. This pretty much means that Chavez Jr. can fight Cotto or whoever he wants next, and Martinez has little choice but to wait for either Chavez Jr. get beaten by someone else or for Arum to change his mind about not wanting to match him against Martinez. The Cotto fight makes sense for Arum because Cotto is one of his Top Rank fighters, as is Chavez Jr. Cotto-Chavez Jr. will make a lot of money and Arum will do well with this fight. Chavez Jr. might even win it if he blows up to 180lbs after the weigh-in. 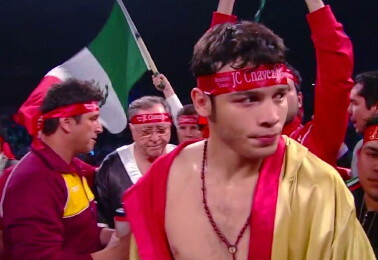 In a fight between a 180 pound Chavez Jr. and a 165 pound Cotto, I think I’d go with Chavez Jr. to win by size alone. Cotto is only 5’7”, while Chavez Jr. is 6’0”, and he’d dwarf Cotto in this fight both in height and in weight. Rubio, 5’10”, could get in the way of Arum’s plans if he can overcome Chavez’s huge size advantage. Although Rubio is three inches taller than Cotto, he normally just a little over 160lbs and would be giving away close to 20 pounds against Chavez Jr.